Searching for fonts that look like Valencia Serial? Look no further! 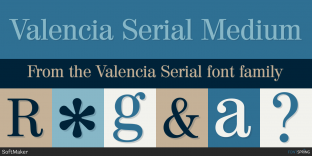 Here you will find fonts that look like Valencia Serial. Use the selector above to match other fonts in the family. Worry-Free! Century Schoolbook FS FontSite Inc.
Worry-Free! Century Modern FS FontSite Inc.
Worry-Free! Marion Typodermic Fonts Inc.
50% off until May 31st! Worry-Free! Baskerville FS FontSite Inc.
Worry-Free! Bodoni FS FontSite Inc.
Worry-Free! Century Old Style FS FontSite Inc.
Worry-Free! Bodoni Recut FS FontSite Inc.
Worry-Free! Winthorpe Typodermic Fonts Inc.